Our range of inward and outward opening timber french patio doors have been developed for security, performance and durability. Over the past decade there has been significant development in patio door equipment, providing improvements to operation, draught sealing and aesthetics. We are now able to provide almost any style of french door and frame configuration, allowing you the freedom to design your own or match an existing style. You can choose from a range of fittings, glazing units, insulated timber panels and a wide range of profile options. Our made to measure wooden patio doors can also be matched into our casement window range allowing them to be seamlessly coupled. We have such a wide range of design options, including frame profiles, glazing bars and frame features that you may want to contact us to discuss you exact requirements. Restrictor Outward opening doors are supplied with a restrictor to limit opening to 90 degrees, preventing damage from the door being blown open against the outside wall. Ventilators We are able to offer a wide range of ventilation options, both in the door and the frame. Options include canopy vents and flush vents in a range of colours and styles. It is also possible to colour match vents if required. Hard Wearing Cill All doors are provided with a teak stained cill as standard, providing a hard wearing finish that doesn't get easily damaged by foot traffic. Astragal Bars This is matched to the sash profile and glazing bead. It is available with or without interbar, with the option to match the spacer bar. Adjustable Hinge Using advanced adjustable hinges the doors can be set up to ensure that they open easily (doors usually require a small amount of adjustment after installation). The hinge is available in the following colour ways; Brass, Polished Chrome, Nickel, Black and White. 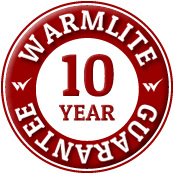 Warmlite use certified Redwood Woodheart® as standard for our Timber/Wooden French/Patio Doors. We also have a range of hardwoods and Accoya modified timber to choose from. We can provide dual colour windows and patio doors with a different colour inside to out or frame to sash. This also allows for the frame and sash to have a different dual colour specification if required. For further information about our beautiful timber / wooden patio doors, a free site survey with a no obligation quotation or to arrange an appointment.